Unlike larger roofing companies in Kansas City, Christian Brothers Roofing is an owner-operated, quality roofing company in the Kansas City area committed to working directly with the customers. 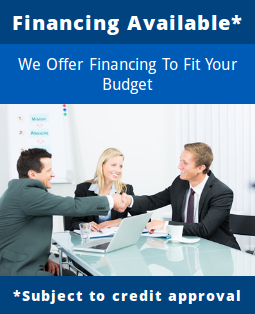 When you work with us, you meet your estimator face-to-face when we come to bid your reroof or repair. As a part of our quality roofing services, we provide prompt, written estimates, and in-person consultations. A quality roofing project is a large undertaking and it involves an investment of time and money. While we work with roofing every day, we realize most of our homeowners do not. That’s why we know that quality roofing begins with excellent customer service. Our approach is to provide as much in-person, face-to-face communication as possible so that we can educate along the way. Rather than emailing a quote, we explain our recommendations, processes and quality roofing materials in detail. We also answer any and all questions our homeowners may have regarding their new roof. Along with quality roofing services in Kansas City, we offer our customers options that meet their needs and their budgets. 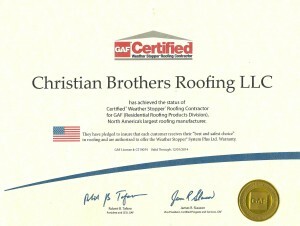 Christian Brothers Roofing has achieved the status of Certified Weather Stopper Roofing Contractor for GAF, North America’s largest roofing manufacturer. We are committed to offering the “best and safest choice” in roofing so that we can continue providing the highest quality roofing service to our clients. Unless a major hailstorm or other uncontrollable acts of nature batter Parkville and Kansas City, thanks to our quality roofing workmanship, your new roof from Christian Brothers may be the last roof you ever need to replace. That’s because we use the right quality roofing materials, install the roof the right way, and offer preventive home maintenance to correct minor repairs before they become roofing replacement issues. A roof is truly an investment (not just a financial expense), and Christian Brothers Roofing provides the best quality roofing services to produce a roof that will last.